Today, absurdity reigns, sleep eludes me, and maybe we’ll all live off of caffeine and fumes for a few more days. Cold brew coffee, please, since it’s getting warmer out. Bottles, cans, jars of it lining my refrigerator, alongside the endless beer stash. A cocker spaniel lays in a warm spot of sunshine in a Vietnamese restaurant, hanging out while his owner drinks a cafe su da. Your hair up makes you look older, she murmurs. You haven’t changed since college, he observes. We’re feeling a bit stiff - me and Ryon (as previously mentioned and thank you for all the well wishes). My shoulders are sore, my back and neck ache. Old age catching up to me or just the additional weight of things that are unknown and out of control? Baggage weighs heavily, whether I acknowledge it or not. In the late afternoon, she toddles further and faster from her parents, lounging on a plaid picnic blanket. She glances back at them while they give her a thumbs up and laugh. The mosquitoes are out in full force, hunting for fresh blood. My legs show the evidence of their hunger, puffed red bumps. Also, I’m already rocking an awkward farmer’s tan, complete with a horribly lobster-red neck - perfect. 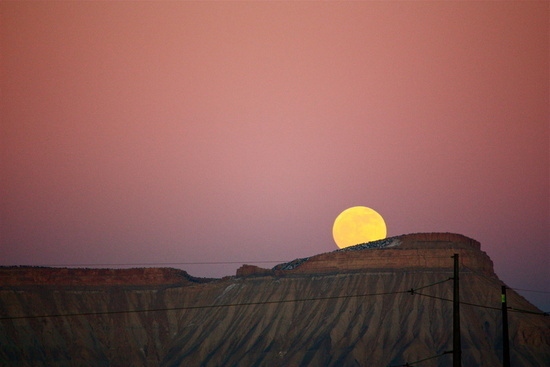 The full pink moon gleams one night but is veiled the next. All good little werewolves remain at home - only drug addicts and murderers are out and about. It rains all weekend and I splash in every puddle. Baggage weighs heavily. And you describe the slope into summer beautifully. Thank you for reminding me how it feels. Wow. just wow. The words and the picture. I'm amazed. This is beautifully written. Hopefully my comment won't detract from that. Endless beer stash: National Beer Day was this week and I let it slip by like every other beer-less day. Failure! Baggage: Does the unacknowledged somehow weigh on us more??? Maybe it's just that it sneaks up on us. Drug addicts and murderers: And I worry about zombies!!! Again, I adore and love reading your raw words and stories! yes, it's really been too long. we need to talk! Beautifully written, I can feel it. "only drug addicts and murderers are out and about. It rains all weekend and I splash in every puddle." Your writing always captures me. Hope you and Ryon will feel better soon! Ah, such poetry, even in the mundane . . .
And you know, puddle jumping is good for the soul. Pretty sure. Hope all is well, I completely understand how it feels to be tonight's dinner by the mosquitoes who seem to be immune to repellents. I'm being feasted on as we speak. i am dreading the days of mosquitoes. i may just go crazy and plant lavender and marigolds in hopes to keep them away. Sunburn and mosquitoes? Sounds like summer!! Kind of sounds like summer to me. Hope you and Ryon feel better soon! Agree with the comments above, Rooth:) You have a way with words. lovely writing, rooth! i'm sorry to hear ryon has been having issues. charlie is my first dog, so all of these issues that animals can have are new to me. you paint quite the picture.. i'm just glad that winter is over. hope your pup starts to feel better. :( sorry to land on such a sad note here. but jump in those puddles! !